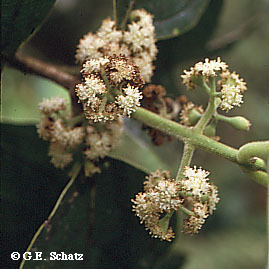 The studies of Lorence (1985) and Philipson (1987) have shed light on the relationships of Malagasy region Monimiaceae. Hortonia (2 spp., Sri Lanka), Peumus (1 sp., Chile), Palmeria (14 spp., New Guinea (mostly), E. Sulawesi and Australia), and Monimia (3 spp., Mascarenes) appear to be the most primitive members of the family (although not necessarily forming a clade), suggesting rafting on Greater India for Hortonia, and extinction of the ancestors of Monimia in Africa/Madagascar given the ages of Mauritius (7.8 MY) and Réunion (2 - 3 MY). Decarydendron (3 spp.) and Ephippiandra (8 spp.) (both endemic to Madagascar) and Tambourissa (ca. 50 spp., Madagascar and Mascarenes) are members of tribe Hedycaryeae, which also includes in E. Malesia: Hedycarya (11 spp., New Caledonia (mostly), New Zealand, Australia to Fiji), Kibaropsis (1 sp., New Caledonia), and Levieria (9 spp., Oueensland, New Guinea to Sulawesi), and in Africa: Xymalos (1-3 spp., from Sudan to S.Africa and E. Congo, disjunct on Mt. Cameroon and Bioko, occurring from 900 - 2700 m).